I have always wanted to go to India. I am fascinated by its culture, its food, its movies, and even its pop music…and did I mention its food? Indian food was, for me, love at first bite. It just kinda knocked my socks of in terms of flavor. Cumin, cardamom, cayenne, ginger, cinnamon, turmeric, pepper, fennel seed…they make me sigh with pleasure and transport me to far-off lands! I like dishes that make their presence felt, that have a taste and aroma that will not be ignored…exotic and strong and full of passion. This is Indian food for me. There are a number of good Indian restaurants in Manila but one of my favorites is a little place in Legaspi Village called Swagat. I discovered it when I was still working in that area and have returned many times since. 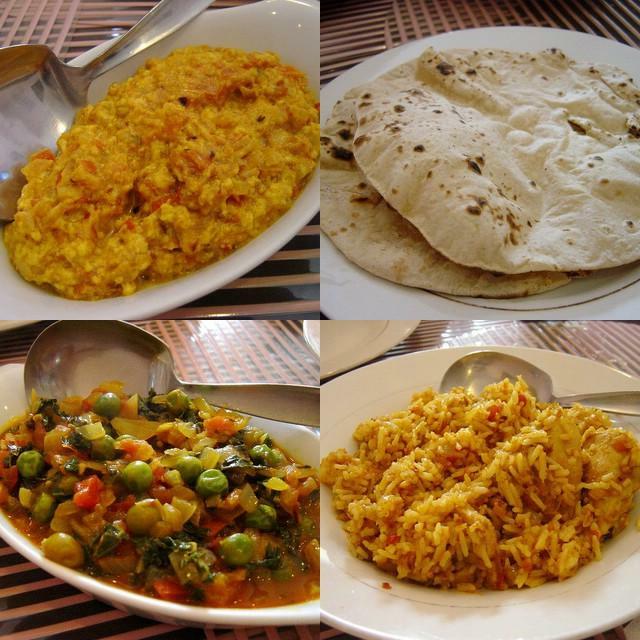 They have an extensive menu which includes vegetarian and non-vegetarian dishes, a good variety of Indian breads, and some great desserts. You’ve got Biryanis and Pullows (rice dishes), Paneers (dishes made with Paneer, a homemade Indian cheese, kinda like cottage cheese), Dals (lentil dishes), Raitas (yogurt dip-like sidings), Pakoras, Samosas…the list goes on and on. You will see your old favorites (Roghan josh, goat meat cooked with coriander leaves, tomatoes and flavored spices, is mine) as well as things you haven’t yet heard of and are yet to be discovered. During this visit we had (pictured above, clockwise from top left) Paneer Korma, Roti, Sangam Biryani, and Mutter Palak. Paneer Korma is pretty much a standard when I go. It’s paneer cooked with onions, tomatoes and different spices. It has just the right amount of creamy-ness, the acid in the tomato acting as a good counter and adding to the taste, and is very flavorful but not too spicy (so good for people who don’t eat spicy, although I am not one of those people). Perfect for dipping our Roti, their whole wheat flat bread. If you aren’t into spicy food a Korma (they have Chicken Korma too) would be a good bet as it is one of the mildest spice mixes/sauces. It uses grated coconut, coconut milk, or yogurt which is what brings down the spice factor and gives it its creamy-ness. You can also order a raita to counter the spicier dishes. I usually get the Cucumber Raita…cool and refreshing. The Sangam Biryani and the Mutter Palak were both firsts for me this time. I usually order a pullow (the Kashimiri Pullow is my favorite — it has currants and nuts and spices) and order my meat dish separately (usually the Roghan Josh), as the biryanis already have the meat mixed in (unless you order a vegetable biryani). But hey, variety is the spice of life, right? Anyhoo, the Sangam Biryani was a very pleasant surprise, rich and tasty and moist, as I find a lot of biryanis I’ve had before to be a little dry. It has both chicken and lamb in it, and both I found very tender and well blended with the spicy flavors of the rice. The Mutter Palak was the first dish among the vegetarian specialties that I tried (as I don’t often wander into the vegatarian portion of menus). It turned out to be a real winner! Peas and spinach cooked with a blend of herbs and spices with gave the dish a good strong character that enhanced rather than overpowered the flavor of the vegetables. I vow to try more of the vegetarian stuff soon. 119 FCC Building, Rada St.
cheap isnt it… naku pag uwi ko sa pinas talaga…. i have few friends from India and have eaten good indian food..
Joey: Yes, the yoghurt ferments the dough. You can use yeast but you have to leave the dough to rise for at least 3 hrs in a warm area, and I mean warm. Tsaka nga pala I added your blog to my list. Enjoy eating! I’ll give the resto a go when I come home. Sorry for the college-girl speak: katakam-takam naman your post! Assads along UN Ave is fantastic, though out of the way. Terrific samosas and biryanis. Hahaha! Did you see their website? It’s pink too! Hmmm, strange coincidence. Another coincidence. I finally made it to Assads today! I only had a few minutes as my friends were waiting in the car so I was running around, crazily grabbing spices. 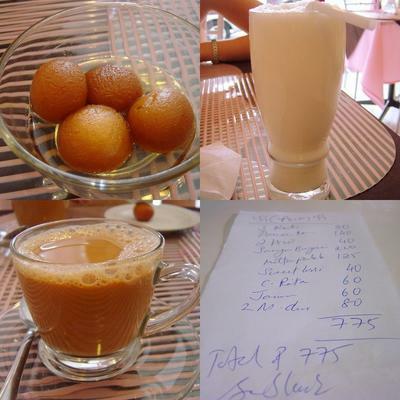 I also got a bunch of gulab jamun…YUM! Will try the samosas and biryanis next time!